Do you know how the little table on the left door stays up? This one seems to have the leg missing, but it doesn't show a place where it was. Also what is the tan curved plastic thing inside by the lift for? Am I missing something I need? Can you post a picture of your cabinet? I have two but I am not sure what you are asking. I don't know, but could the plastic thingie be a knee control? I used to have one on my old Singer. It takes the place of a floor pedal. That may be a lever to move the lift up and down. A knee control would come as part of the machine not the table. A knee lifter controls the presser foot and the foot pedal controls speed of machine. Perhaps you could call Horn and ask about the panel. 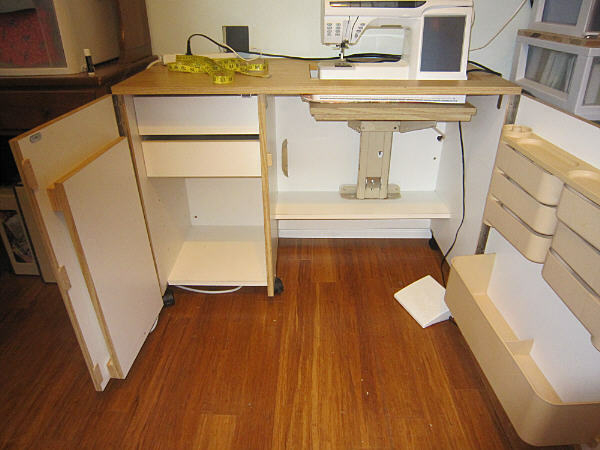 By looking at the knobs on the sides it may go inside the cabinet as a shelf. If you look closely at the drawers inside the cabinet they have the same knobs. Just a thought. I think you are missing some pieces! What happens if you pull the draw out will it fit on that? I tried setting the table on the lower drawer and that doesn't work either...it extends into the seating area. Do you know which cabinet it is? There looks as if a piece of metal that pulls out from right side of top draw. Then it looks as is something fits into the top of the door also on the left. With the cabinet number or name you could definately get help. Quick thought looking at cabinet again. 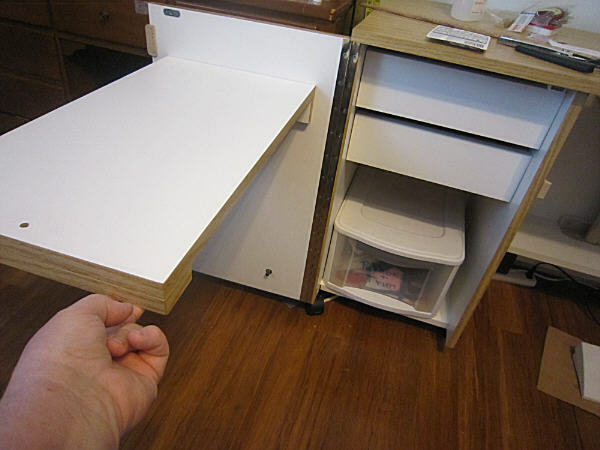 Will the door open wider tobe level with rest of cabinet . And will the door fit at the end of the cabinet left side onto the door . Then a leg could be missing. Last edited by DOTTYMO; 08-11-2013 at 06:42 AM. Can't find model # anywhere...just says Horn of America. No metal piece to come out above top drawer...there is a magnet to keep the door closed. The door does open out to be flush with front of cabinet. No legs and it doesn't show any marks like there would have ever been one...that is a big mystery. There is a hole at the bottom of table that I assume held a pull to lift it. I have a Horn, but a different model. The shelf on the door on my model lifts up and there is a type of leg that pulls out that the shelf rests on. Could you post a picture of the shelf that is attached to the door lifted up? I can't figure out what else to suggest to you. 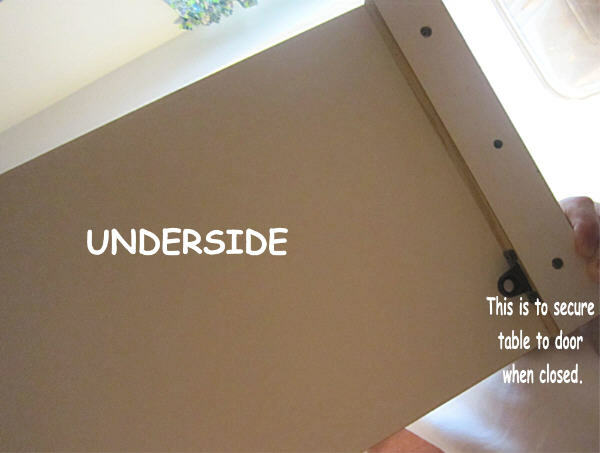 Does the leg come out of the cabinet or is it attached to the table's underside? Here are pics of my table held up and under. Last edited by nativetexan; 08-11-2013 at 09:03 AM. Maybe you can contact the person you bought it from and ask if there is another piece, or contact Horn and ask if they sell replacement parts. Hope this helps. THANK YOU THANK YOU! That is it....and now I understand what is missing...I think my husband can make that piece. I never thought of it looking like that. Nativetexan....I love your idea of a plunger for a leg too! You all have good imaginations...Thanks again for all you ideas and suggestions...brain storming does work.